"The steel seduced me... I was steadily pulled back in time and back in technology into the hot, dirty, primitive, ancient, exquisite world of the blacksmith." When one thinks of blacksmiths, what's typically conjured is the image of crusty old fellas in overalls scratching beards with soot-covered hands. Maybe we recall movie scenes where dusty metal workers pounded out horseshoes or plebeians fashioned swords for swarthy men in tunics. What we don't typically imagine is anything contemporary, particularly artistic or, certainly, female. Until now. Meet Heather McLarty, a true "woman of steel," who's not only become one of the most renowned, respected, and sought-after "artist blacksmiths" in the country, but is someone who's elevated the craft with her almost mystical respect for the process: "As an artist blacksmith it is my joy, as well as my job, to transform industrial materials into soulful sculpture using fire, anvil and hammers; mind, body and heart." 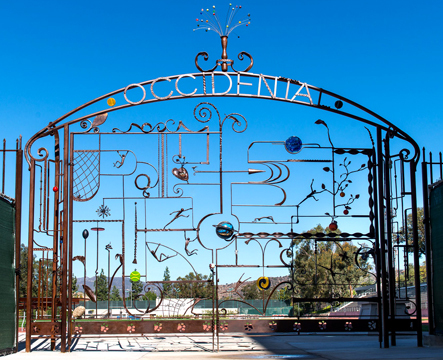 "When I first saw the gate, I was absolutely stunned by the metal work and detailed craft," said senior, Mariah Napoles. "As a student who knows the basics of working with metal, I was very much impressed. I could tell a lot of thought and passion went into it. Each element of it represents the foundation of a liberal arts institution, and I'm so happy it serves as the entrance to the Patterson field." Another student, Carly Mee, echoed Mariah's sentiments: "I walked past it today and thought it's very unique and really catches your eye as you walk by! I love the vibrant colors and the curved-shape parts of it -- it doesn't conform to the structure of normal, straight, dull-colored gates, which makes it stand out." Brittany Vacura added, "It's a great representation of Oxy athletics; sports mixed with a liberal arts education that allows us to be creative and independent thinkers." I started as a prop builder using lots of different materials to make things for live theater. The first professional theater I worked at did a lot of steel work so I learned to fabricate (cut and weld). I worked building props in theaters all over the west coast for almost 20 years and the metal projects became my favorites. About 1991, I quit my last theater job in order to build steel furniture. While looking for ideas for projects, a friend lent me some metalworking books; all the most attractive pieces were forged. That began my quest for those new skills. Well, new to me. I was working backwards technologically. To me, blacksmithing is specifically changing the form of the material, usually mild (that is low carbon) steel. When steel is at the right temperature (from about 1,500 degrees to about 2,400 degrees F) it is squishy, much like clay; you just can't touch it with your hands. Blacksmiths find ways to squish it into new shapes using tools, starting with squishing it between a hammer and anvil. Metal art is a more general term that might imply many techniques and technologies including hot forging (blacksmithing), welding, cutting, grinding, casting, machining and others. Because of the very visceral and ancient nature of blacksmithing, I like to think of myself as an "artist blacksmith," although I do use other metalworking techniques along with those ancient ones. Clearly the Occidental gate was a prestigious and highly demanding commission, and I wondered -- as we've seen in so many movies about fine artists -- if upper-level micro-managment ever got in the way of her artistic vision. I asked Heather if the process had been a collaboration or a solitary pursuit (her private "studio" is a large Sioux-style teepee in the backyard of her Highland Park, California, home). The Oxy gate was truly a dream job! I worked directly with the president of the college, Jonathan Veitch, and the chief of staff, Rosita Afar. They showed me the site and we talked about the feeling they wanted for the gate and then they let me go. I had done a sketch previously for a different site that wasn't used and I started from there. I worked on ideas on my own until I came up with a sketch I was fairly happy with. When I presented the sketch, we discussed it, I made some minor changes and I was off and forging. They were incredibly supportive during the process and made more than one studio visit to see the progress. We adapted a few things as we went along but very little was changed from the original design. This is the first time I did a project using so many other craftspeople and artists. That was a real luxury. Cathi Milligan designed and made all the glass pieces. I think of them as the jewels on the gate. My friend Phillip Bowling of Noble Forge did all the assembly. He and his fabricator, Abe, made everything work right, straightened out pieces, figured out the mechanics and made all the pieces fit. My friend Pat Downing came up from San Diego to take charge of the finish, doing the lovely patina and clear coat. The installers were the Bertin Brothers. They -- and a welder named Jim -- were also just top notch. 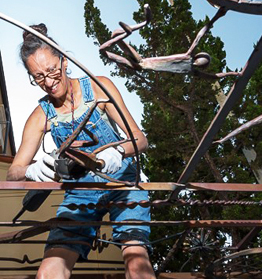 Other friends helped with parts of the gate; Louie Arce cut the tiger paws along the bottom border and Nancy Tarczynski made the spring steel "bouquet" at the top. It was a group effort. The possibilities are endless. There is always something new to learn and explore. It uses all parts of a person; it engages body and mind, heart and soul. It uses creativity, science and math. One thing about blacksmiths is that, almost without exception, they are incredibly generous. It is a craft where the people involved have really created a community. They share information, tools and techniques without hesitation. She suggests new artists find a hands-on place where they can take classes and connect to experienced craftspeople, such as Adams Forge in Los Angeles. She also recommends exploring the resources available via ABANA, Artist Blacksmith Association of North America. I'm really lucky that I have projects backed up. I have great clients and they seem willing to wait! There is so much I look forward to doing, more work, more travel and study and teaching the craft to others. The luckiest part is having such an incredibly loving and supportive husband. That has allowed me the luxury of learning and exploring this craft for many years and hopefully many more to come. Visit Heather's site at SteelCrazy.biz. Follow Lorraine Devon Wilke on Facebook, Rock+Paper+Music, and Addicting Info; for details and links to her other work, visit www.lorrainedevonwilke.com.